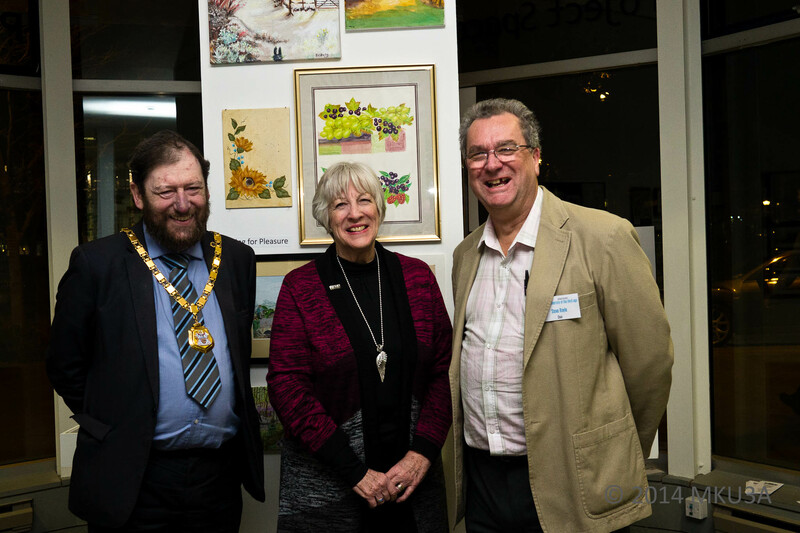 Our exhibition,showcasing the talents of Milton Keynes U3A Members, was launched at a preview event held on the evening of Wednesday 6 March prior to opening to the public from 7 to 30 March. 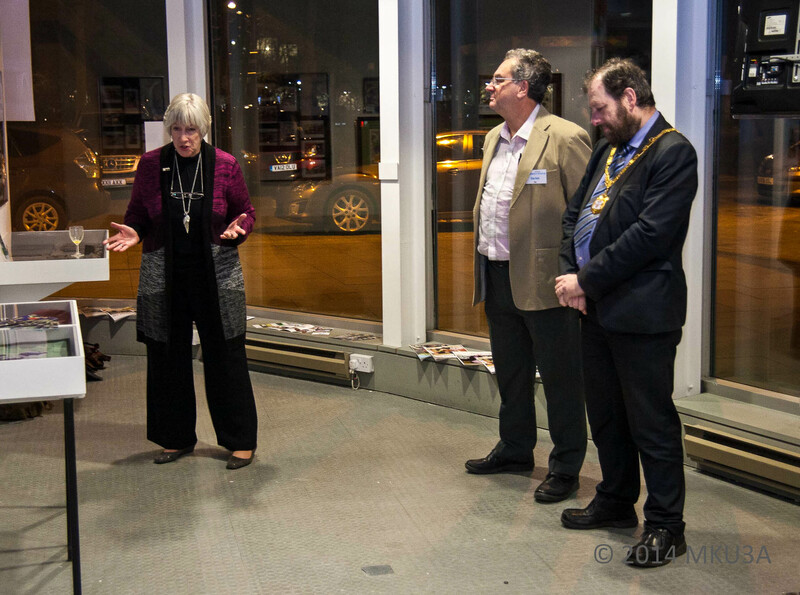 The preview was attended by the Trustees together with The National Chairman of U3A, Barbara Lewis, the Mayor of Milton Keynes, Councillor Brian White and Mayoress Mrs Leena Lindholm-White, the Head of Learning at MK Gallery, Emma Fry as well as the Chairman of Buckingham U3A, Pam Tonge. (left to right) The Mayor of Milton Keynes, Councillor Brian White, the National Chairman of U3A, Barbara Lewis and Milton Keynes U3A Chair, Stephen Royle. 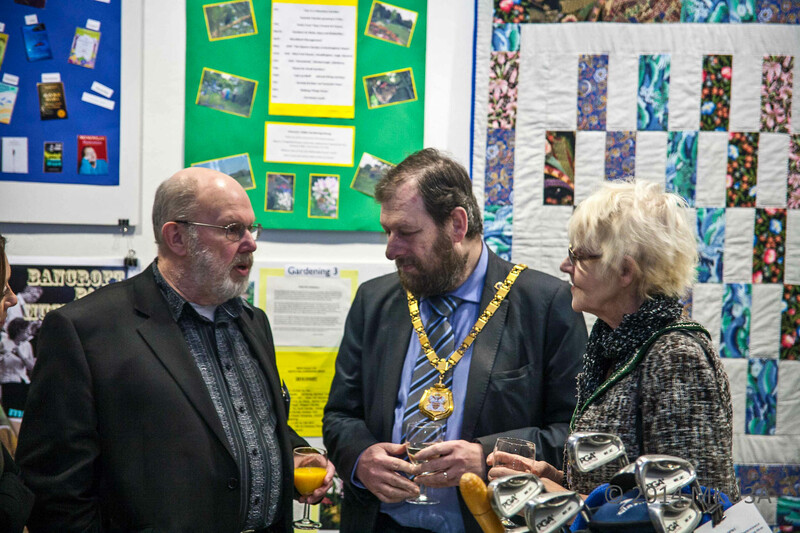 (left to right) The National Chairman of U3A, Barbara Lewis, Chair of Milton Keynes University of the Third Age, Stephen Royle and the Mayor of Milton Keynes, Councillor Brian White. Barbara Lewis commented that this was one of the best exhibitions she had seen presented by any U3A in the country in both content and presentation. 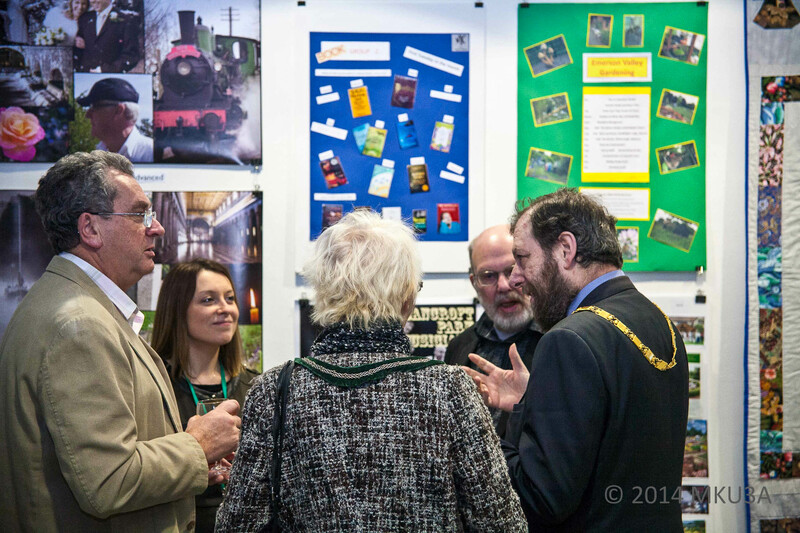 (left to right) MKU3A Webmaster Derek Barrett talks with The Mayor of Milton Keynes, Councillor Brian White and Mayoress, Mrs Leena Lindholm-White about the exhibition. In his speech, the Mayor said that he didn’t realise quite how much the U3A has to offer and that with the population of MK increasing fastest in the 50 age range, we play a major role in providing opportunities for citizens of Milton Keynes who are no longer in full-time employment. The Mayor officially declared the exhibition open. 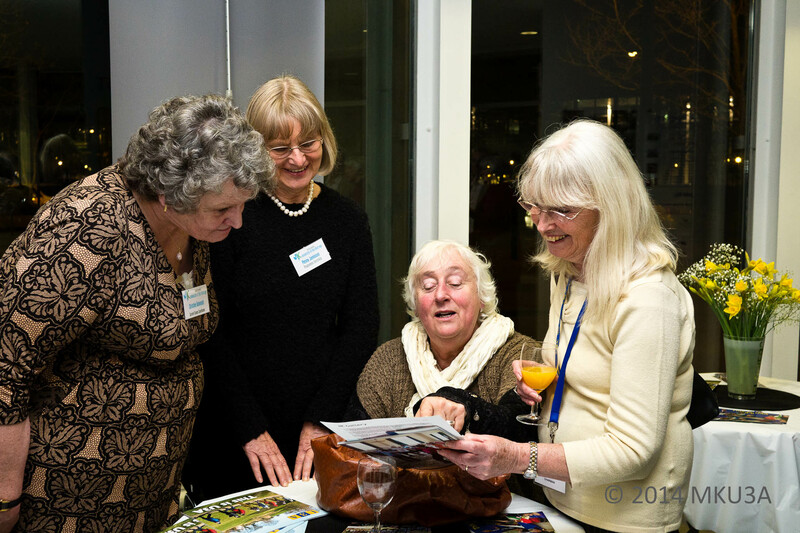 (left to right) MKU3A Trustees Christine Behrendt and Penny Jamieson with the Chair of Buckingham U3A Pam Tonge. Our Guests had a chance to admire the work of MKU3A members that is on display in the form of posters, samples of craft and an Audio Visual presentation. (left to right) Chair of MKU3A Stephen Royle, Emma Fry of MK Gallery, Mayoress Mrs Leena Lindholm-White, MKU3A Webmaster Derek Barrett, and the Mayor of Milton Keynes, Councillor Brian White. View outside of the Project space during the preview. 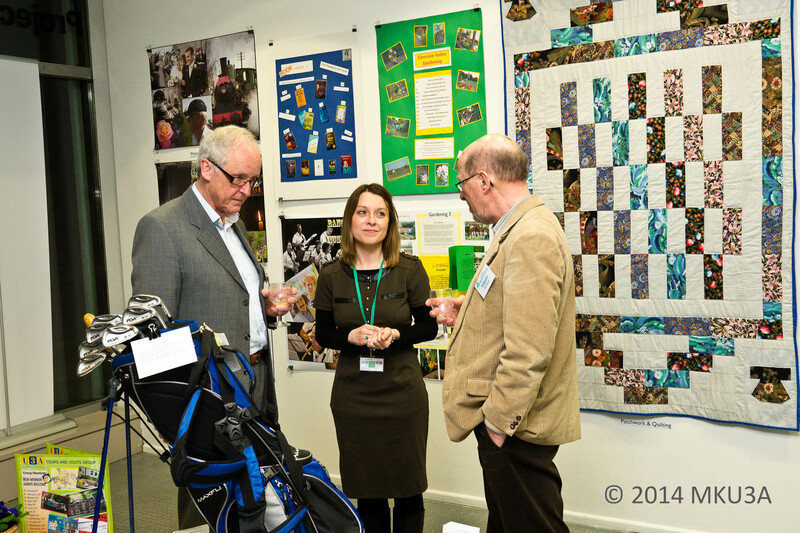 Trustees Marcel Mallens and Phil Mountford chat with Emma Fry, Head of Learning at MK Gallery. We hope that members and others who visited the exhibition enjoyed the displays in the Project Space and the group activities that were held in the Events Space next door. Our thanks go to all members who participated, either as contributors or as ambassadors during the event. 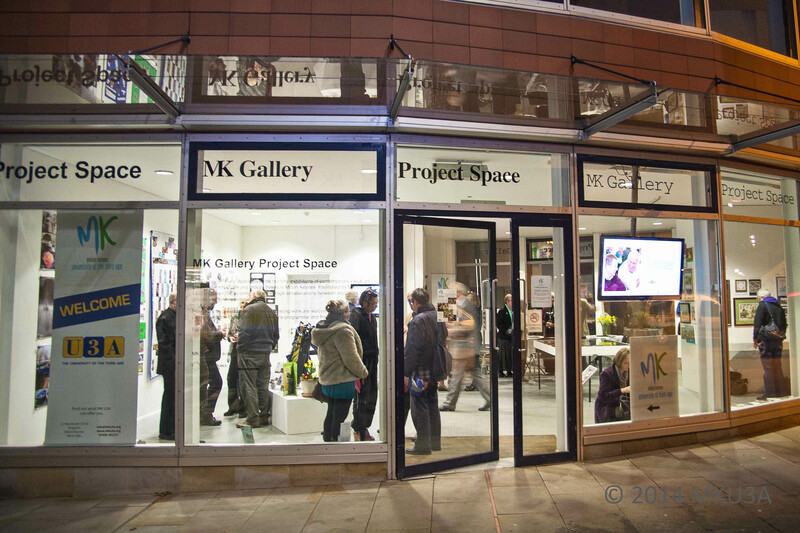 Very many thanks to Head of Learning Emma Fry and the staff of the MK Gallery for loaning us the Project Space for the month and doing so much work in helping us prepare the show and loaning us one of their technicians to help set it all up.